1 bedroom, 1 bath with lake access and and amazing lake view! 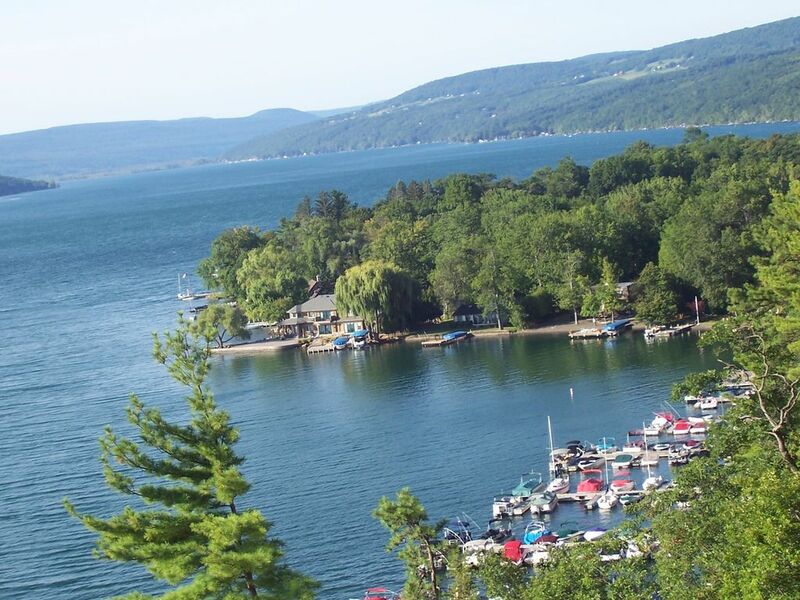 Welcome to 162 Cliffside, a one bedroom, one bath condo, overlooking Canandaigua Lake. This 4th floor condo, in building 5, is part of Bristol Harbour Resort. The many amenities of Bristol Harbour include a restaurant and hotel, tennis and pickle ball courts, and a Robert Trent Jones Golf Course. The first thing one notices upon entering this condo is the incredible view. The bedroom, with one large closet, is off to the left. Next to the bedroom is an alcove, containing a washer/dryer combo; a vanity, separate from the bathtub area; and a small desk. A hallway, with another large closet, leads to the kitchen, dining/living area and balcony. Preparing meals is a pleasure in this open space high above the water. The condo sleeps three to four people. There is a queen size bed in the master and a double bed futon in the living room. A 40 inch HD TV/DVD player and a speaker for an IPhone or an IPod is provided for your listening and viewing enjoyment. The kitchen is well equipped with seating for 7 people inside and 4 outside. An electric George Foreman grill is on the balcony. The linens are new as are the beach towels. There is ample reading material and a jigsaw puzzle in case it rains. Mountain Ski area is 15 minutes away. Wishing you an enjoyable and welcoming vacation experience no matter what season you choose in Canandaigua - “The Chosen Spot”. My family purchased a home on this lake in 1946. i have fond memories of spending summers here with family and friends. My husband and I purchased the family home in 1995. We sold it in 2006 when it became too difficult to maintain. I spent one year renting and then decided I needed a new space just for me! I live in Florida now, but wanted to be able to return here in the summers. I wanted a lake view, water access, a tennis court, and activities. This property was perfect. I live in Florida now because I teach an exercise class. When I decide to 'retire' I will spend more time here. One sees the incredible view as soon as one enters this unit. I love the fact that the kitchen and living room overlook the lake. This unit is small, but the alcove area makes it more private than most. It has two large closets. The location is great because it is high, so there are no trees blocking the incredible view. One bathroom with a tub. A door separates the vanity from the tub. Canandaigua is a charming town with shops, restaurants, and local breweries. Vineyards are nearby as well. Bristol Harbour resort includes a golf course, tennis courts, a restaurant, walking trails. The beach is a short walk away. This condo is high above Canandaigua Lake. Perfect view. The beach is a short walk and elevator ride away. Gorgeous cliffside view of Canandaigua Lake. New units in living room and bedroom. 2 sets of sheets for queen size bed in closet. 2 sets of double bed sheets in the toy box. Must give make of car and license number to Bristol Harbour resort. 1 assigned place and plenty of unassigned parking. Very open, adjoins dining area and balcony. Keurig coffee maker and a Mr. Coffee coffee pot for 4 cups of coffee. Salt, pepper, sugar, some spices, oil and vinegar. Ample supply of dishes and cooking utensils. Blender. Fully equipped kitchen overlooking the lake which makes cooking a "joy"! 4 seats at counter. 3 at the table. Outdoor seating as well for 4. 40 inch HD TV, flat screen with cable. Paperbacks in the book case. Small balcony with high bistro table which seats two. Four other chairs and small tables. Bristol Mountain ski area is about 15 minutes away. 3 tennis courts at Bristol Harbour Resort. Robert Trent Jones Course across the street. There are restaurants and art galleries nearby as well as Sonnenberg Gardens, the Granger Homestead, Bristol Valley Playhouse, and CMAC. For wine lovers, there is the Finger Lakes Wine Trail with too many wineries to mention. One can also take cooking classes at the New York Wine and Culinary Center. Small farmer's markets provide delicious produce during the summer months. Perfect home away from home overlooking the lake!! Comfortable & relaxing condo that meets the needs of a couple looking for a time & place to enjoy leisure living. Situated for day trips as well as local tours. Thanks Pat for sharing your home with us. Thanks so much Lucy for taking the time to write a review. I am glad you and your husband enjoyed the area and your stay at my little paradise. This is the second time we have stayed in this one bedroom condo and enjoyed ourselves just as much as the first time. The bed is comfy, living room sunny and comfortable, kitchen well equipped and even had a brother and his wife visit and spend one night with us on the futon which worked out fine. The view from the balcony is amazing. So serene. We will probably rent again next time we are visiting family in the Canandaigua region. This condo is so clean and bright. We loved sitting on the balcony and looking at the lake. Away from all the hustle and bustle. So glad you enjoyed your stay. It was a pleasure to have you visit again. Pat's home was a wonderful spot for my parents 1 month stay. It was super clean, tidy and offered amazing views of Canandaigua Lake. I would highly recommend this property!! Thank you Pat for being a great host and super easy to work with. Thanks Kim for the kind remarks. So glad your parents were comfortable there. I was pleased with the space and delighted with the view! Everything we needed was here, with the addition of Netflix access and a nice bottle of wine. It was easy to park, easy to access Canandaigua as well as countryside. We swam at the little protected beach. The view from the balcony was beyond great as the weather changed and the stars came out. This condo was just wonderful. It was clean and cozy and just perfect for my husband and I. It was well furnished and the bed was very comfortable. Patricia was just wonderful showing us what we needed to know to make our stay perfect. We only wish we could have spent the entire summer there. The View from the balcony was amazing. We spent many hours just gazing at the lake. The beach was so clean and the water refreshing. We would definitely recommend this condo for a relaxing vacation. We have spent many vacations in Canandaigua and this was definitely the best place we ever stayed. It is just far enough from all the hustle and bustle but close enough to town the enjoy the restaurants. We recommend Eric's Office for a great meal. (Reservations are suggested). Simply Crepes is another favorite. Heron Hill Winery is a mile away. Great wine tasting and every weekend there is pizza night and a band. Nice family entertainment. When booking this reservation please remit the $250 refundable damage deposit, plus 50% of the rental amount and a $75.00 cleaning fee. The remaining balance is due 30 days before arrival. Rates are subject to change until payment is received. 100% refund if cancelled at least 30 days before arrival. Bookings cancelled less than 30 days of the arrival date will not receive a refund. 100% refund if cancelled at least 30 days before arrival date. Bookings cancelled less than 30 days of the arrival date will not receive a refund. cancelled 30 days or less will result in This Owner accepts HOMEAWAY payments.